Ballet Certificates Templates – Is your daughter in ballet? Or, perhaps you teach ballet? Whatever the case, please review these fun and stylish certificates. You can personalize via the text fields with names, instructor’s name, date, words of praise and more. Very cool! Just pick, personalize, print and present. It’s so easy, and it creates a lasting keepsake for a special time in a ballet student’s life. With six certificates to choose from, there’s something for everyone. Give the same one to every student in class or pick and choose. Recipients’ families may choose to frame these lovely, ballet awards. However, they can be posted as is to bulletin boards, refrigerators or to walls. Kids love recognition and receiving certificates. Plus, it will make you feel great to award them! Who doesn’t like being awarded certificate? Many folks wait for the completion of a class to award these certificates. But, with six to choose from, consider handing out different certificates throughout the practice schedule. Perhaps award one after the first live performance, one after a difficult practice, one after a significant accomplishments, etc., etc.. You get the idea. No need to be stingy. And, you can award these certificates year-after-year, class-after-class. Brilliant! Check out the Dance of the Sugar Plum Fairy ballet performance. Ballet award certificates will keep coming kids back to ballet for more. Everyone loves to hear positive praise and receive awards. Here’s an inexpensive way to recognize all the ballerina’s you know. 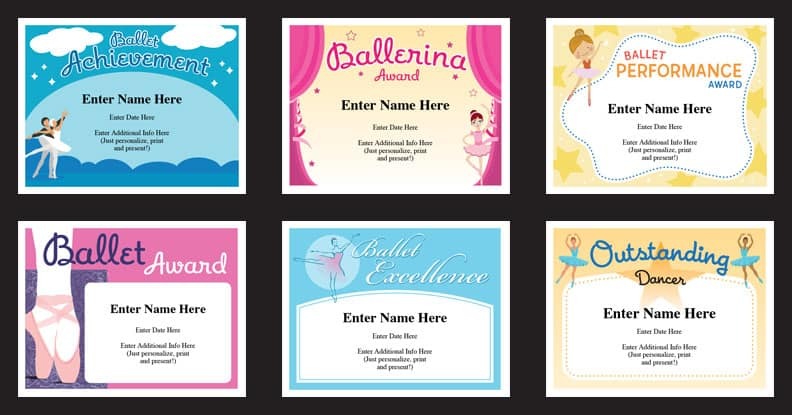 Purchase the Ballet Certificates Templates, and receive the Classroom Bundle FREE!